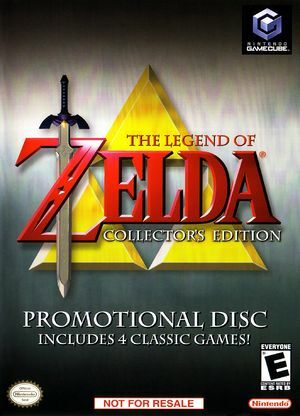 The Legend of Zelda: Collector's Edition is a compilation of four video games from Nintendo's The Legend of Zelda series, a twenty-minute demo of The Legend of Zelda: The Wind Waker, and two featurettes. It was released for the Nintendo GameCube on November 7, 2003 in Japan; November 14, 2003 in Europe; November 17, 2003 in North America; and March 19, 2004 in Oceania. Not available for purchase, it was distributed through various promotions and bundles. NES titles and Ocarina of Time can have minor issues with interlaced mode and pause screens respectively. This is solved by setting External Frame Buffer to Real or hold B on the controller during game startup to activate Progressive Scan. Fixed with Hybrid XFB in 5.0-5874. Setting Internal Resolution to a multiple of 2x causes blurry graphics in NES games. This can be fixed by using native resolution, 3x resolution, 5x resolution, etc. 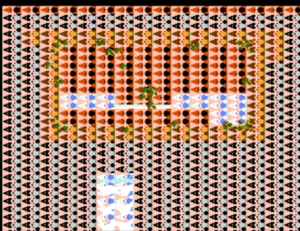 Using Force Texture Filtering or Anisotropic Filtering causes corrupt graphics and text in NES games. Because of this, both settings are defaulted to "Off" and "1x" respectively by this title's GameINI. The Gecko Code fixes clipping in the 3D games. Make Sure the Dolphin Widescreen Hack is Disabled before running the game to use this code. The graph below charts the compatibility with The Legend of Zelda: Collector's Edition since Dolphin's 2.0 release, listing revisions only where a compatibility change occurred. This page was last edited on 18 November 2018, at 03:59.